Prussian family, members of which in the nineteenth century settled in the United States of America. 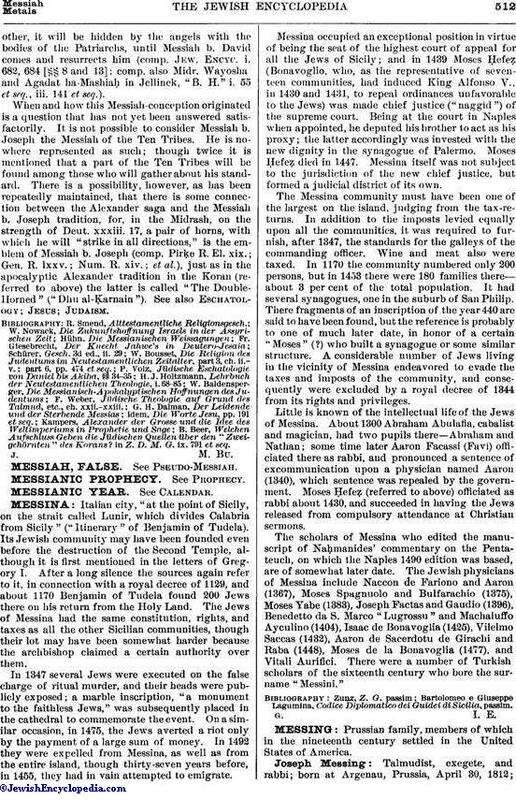 Talmudist, exegete, and rabbi; born at Argenau, Prussia, April 30, 1812;died in London, England, March 20, 1880. The only rabbinates he held were those of Gostyn and Witkowo, Posen. 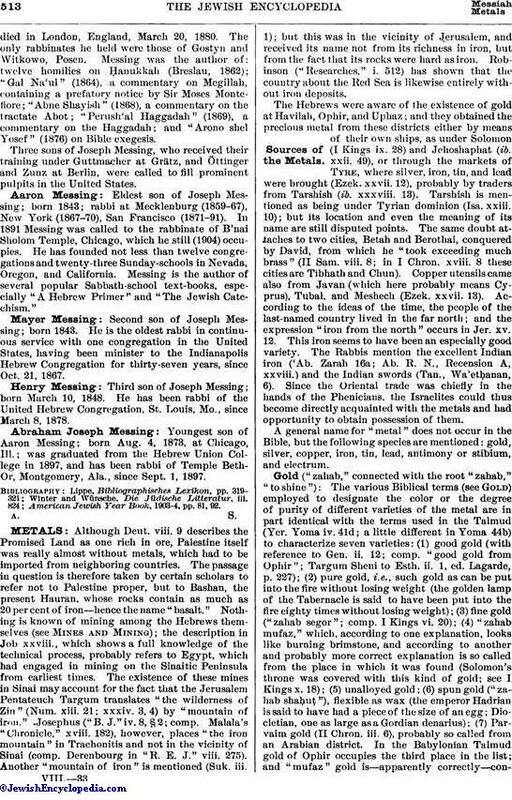 Messing was the author of: twelve homilies on Ḥanukkah (Breslau, 1862); "Gal Na'ul" (1864), a commentary on Megillah, containing a prefatory notice by Sir Moses Montefiore; "Abne Shayish" (1868), a commentary on the tractate Abot; "Perush'al Haggadah" (1869), a commentary on the Haggadah; and "Arono shel Yosef" (1876) on Bible exegesis. Three sons of Joseph Messing, who received their training under Guttmacher at Grätz, and Öttinger and Zunz at Berlin, were called to fill prominent pulpits in the United States. Eldest son of Joseph Messing; born 1843; rabbi at Mecklenburg (1859-67), New York (1867-70), San Francisco (1871-91). In 1891 Messing was called to the rabbinate of B'nai Sholom Temple, Chicago, which he still (1904) occupies. He has founded not less than twelve congregations and twenty-three Sunday-schools in Nevada, Oregon, and California. Messing is the author of several popular Sabbath-school text-books, especially "A Hebrew Primer" and "The Jewish Catechism." Second son of Joseph Messing; born 1843. He is the oldest rabbi in continuous service with one congregation in the United States, having been minister to the Indianapolis Hebrew Congregation for thirty-seven years, since Oct. 21, 1867. Third son of Joseph Messing; born March 10, 1848. He has been rabbi of the United Hebrew Congregation, St. Louis, Mo., since March 8, 1878. Youngest son of Aaron Messing; born Aug. 4, 1873, at Chicago, Ill.; was graduated from the Hebrew Union College in 1897, and has been rabbi of Temple Beth-Or, Montgomery, Ala., since Sept. 1, 1897. American Jewish Year Book, 1903-4, pp. 81, 92.